More than a year ago we set out to revise and improve the Professor Tweed. Several approaches were pursued, but we were unsatisfied with the results. One of the downfalls was the high level of interaction between the tone and gain controls. Just as in the original Princeton amp, the tone control became ineffective when gain was set close to maximum. In addition, this arrangement was adequate only for a very specific type of sound. We decided to step away from the inspiring amp's circuit and concentrate on developing a solution superior both in tone and usability. 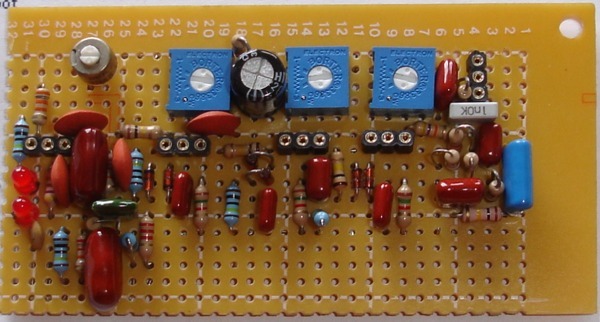 Builders may notice that the design does not correspond to any particular existing amp or pedal circuit. Though the use of a modified "Big Muff Pi" style tonestack is apparent, it is placed before the overdrive sections as opposed to its common location as a final tone shaping device. The result is a circuit that is much more flexible and refined than its predecessor, and in our opinion it captures a wider variety of Fender-like tones. We have named this new circuit Azabache, which is the Spanish word for "black amber". The duality of its name recalls the Blackface and Tweed aesthetics. 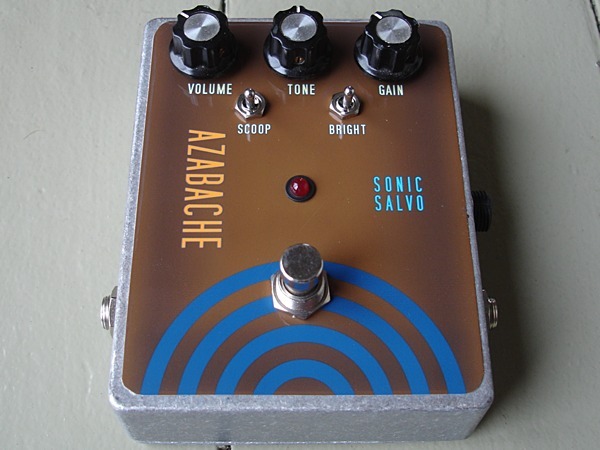 As for the Gain knob, it can adjust the sound from almost clean, to a warmed-up light overdrive, to a medium overdrive, to a quite gainy overdrive. 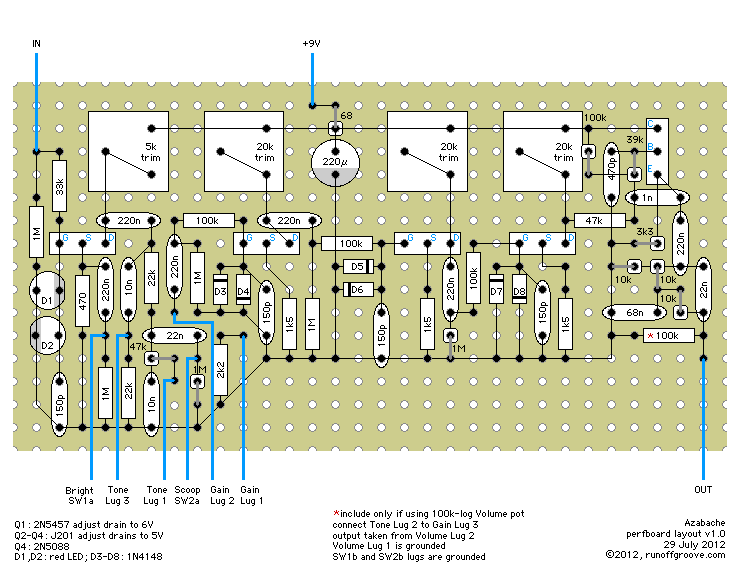 Each stage is set up to produce a moderate amount of gain while avoiding hard clipping in the JFET itself. The result is a refined overdrive with a natural note decay that reacts very well to the guitar's volume knob. Finally, the tone shaping that takes place at the end is essentially modeled after the distinct frequency response of a Jensen P10R speaker, with its bright tone and deep 400 Hz notch. We think of this part of the circuit as a mini-Condor Cab Sim because the frequency response is akin to the Condor, however adapted to take into account that another amp and guitar speaker will follow afterwards. Overall tone was optimized for solid-state amps that are moderately bright. 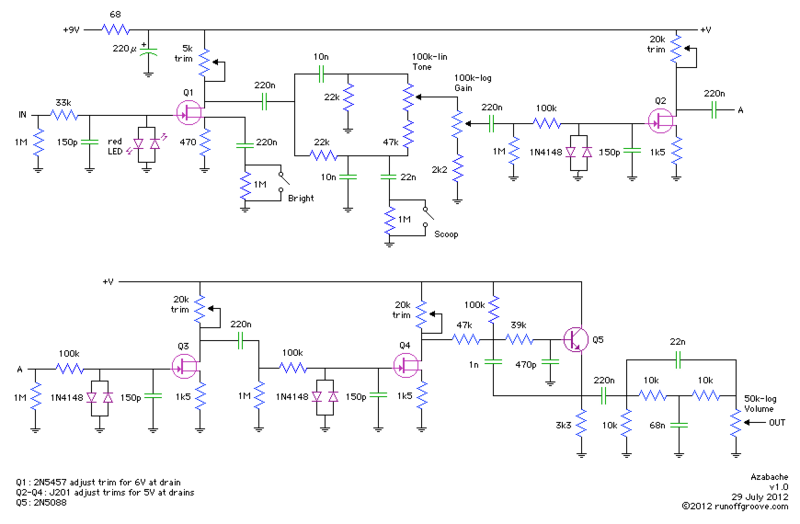 If using a very bright guitar and/or amp it may be desirable to tame overall brightness a bit by changing the 1n capacitor between Q4 and Q5 to 1n5. Conversely, a bit more brightness could be achieved by replacing said capacitor with 680p. For best noise performance, it is recommended to use metal film resistors and replace the drain trimpots with fixed resistors once the necessary value is determined. Good wiring and shielding techniques are also encouraged. Azabache by runoffgroove.com is licensed under a Creative Commons Attribution-NonCommercial-ShareAlike 3.0 Unported License.